I have been working with Dr. Burn since 2011. I interned here while a senior at Irmo High School and knew this is where I wanted to work. 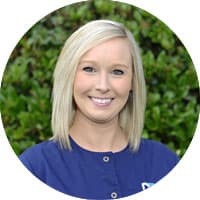 I love serving our patients and making sure they are greeted and treated with a smile every visit. I take pride in making sure our patients, new or established, leave our office with a great experience. I enjoy spending time with my family and friends, and especially our family pup Murray! 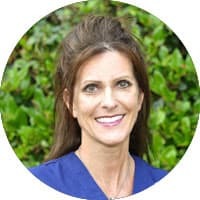 I moved to Chapin from Charleston, SC, in 2011 and have been a dental assistant for over 23 years. I have worked with Dr. Burn for over seven years and love our patients! I strive to make every patient feel comfortable during their visits. My husband, Chris, and our two teenagers, Jack and Sophie, keep me busy during my spare time. I enjoy spending time with my family and going to the beach. I have lived in Irmo since 1993, moving here from Rockville, MD. My husband, Jim, is retired from the US Postal Service. I received my certification as an expanded duty dental assistant from Old Dominion University in Norfolk, VA, in 1977, and have been a certified dental assistant for almost 41 years. I have worked with Dr. Burn in the Lexington Children’s Dental Clinic for over 30 years and at his office since 2011. I have two sons who have blessed me with two grandsons, Carson and Sutton. In my spare time, I enjoy yard work and being outdoors walking my three dogs. I am a graduate of Midlands Technical College and a registered dental hygienist with 30 years’ experience. I’m originally from St. George, SC, but have lived and worked in Columbia for over 28 years. I love being a hygienist and working with Dr. Burn – for over seven years. My husband is from Massachusetts (Go Patriots) and we have two furry children – Lucy, a golden doodle, and Shadow, our adopted cat. After work, I enjoy running, outdoor activities, and walking Lucy. 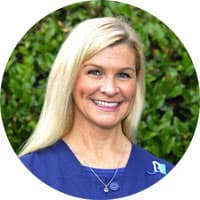 I grew up in Spartanburg, SC, and have been a registered dental hygienist for nine years. I earned a BS in Biology from Erskine College and attended the dental hygiene program at Trident Technical College. My family moved to Irmo three years ago, and I became a full-time mommy to our then one year old son. We have been patients of Dr. Burn since moving to the area. At our routine cleaning appointment over the summer, one thing led to another and now I am lucky enough to be a part of this amazing dental team. I love being a hygienist and meeting new people.